Comfortable cottage classified 3 *** ranking prefectural by gites de France. On the road craftsmen. house of full foot with superb view on Ile Rousse the sea and the mountain. The terrace is shaded. the garden is closed and we can put the car there. The house can accommodate up to 5 people is very comfortable and the decoration in perfect harmony with the places. You will find all the comfort of a modern house WIFI etc. 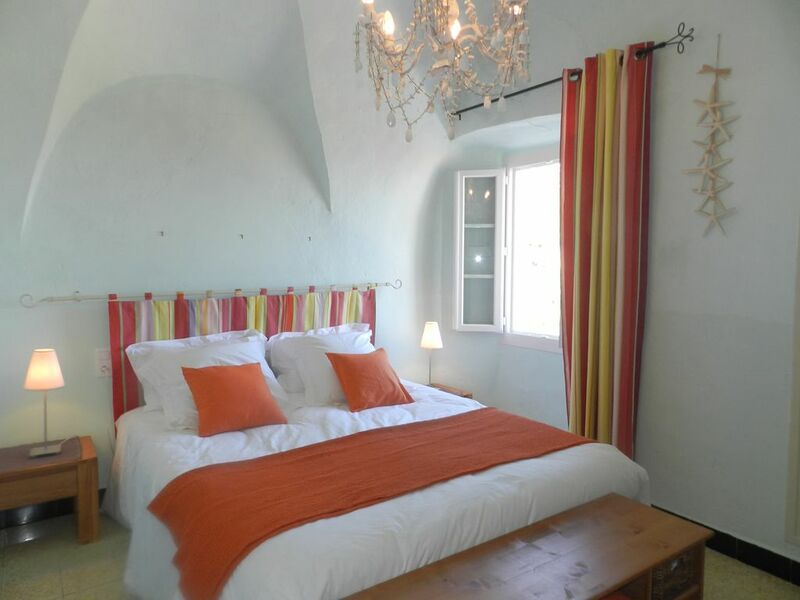 with charming vaulted rooms very typical of traditional Corsican houses. The 180 ° SPLENDID view overhangs Ile Rousse bay and the mountain. You can admire the landscape of the garden, terrace, bedroom or living room. The BBC gas WEBER is very easy to use. You will have a large master bedroom with new beds mattress ep 28 cm with a mattress of 160 x 200, possibility of adding a baby bed a cupboard with shelves and a wardrobe + various complementary storage 2 bedside tables and a new flat screen TV. You have square duvets and pillows (65 x 65) and rectangles (50 x 70), a chest of drawers 9 drawers, a wardrobe, a dresser, table and 4 chairs + 1 chair table living room on wheels and a flat screen TV. The fitted kitchen has an induction hob, a dishwasher, a hood, a fridge with freezer and a microwave. In the bathroom you will find a washer dryer, a hair dryer, magnifying mirror and plenty of storage space. The suspended toilet is independent. Guides on Corsica are at your disposal. Miscellaneous: children are welcome and good animals are allowed. Spacious and well equipped the bathroom together space, storage, design and ergonomics. You will find the sliding storage under the sink, the changing mat for your children and washer / drying (2013) and a magnifying mirror, hair dryer, GREAT SHOWER ITALIAN and heated towel rail. A booster seat and chair BABY and to hang on a table, 1 changing mat, 1 folding bed, 1 small pot WC, 1 child stool and outside 1 small garden seat. The kitchen is new and very well equipped, you will lack nothing. the dishwasher drummer. A gas grill Weber 'you will be very comfortable outside on the 2 terraces at your disposal. One features a wrought iron table and 5 seats wood and metal, the other with 2 relaxation deck chairs for relaxing and a relaxation lounge with 1 sofa and 2 chairs with gray cushions .The always breathtaking view on the ile rousse and the mountain. you can around you to try the climbing; surf fishing; Snorkelling; Inshore Fishing, tubing, Hunting (big game), hunting (small game), Jet-skiing, equestrian events, swimming, tennis, golf, windsurfing, water skiing, mountain biking, mountaineering, paragliding, deep-sea fishing ..
Zwar ist das Haus schon älteres Symester,aber die Einrichtung,besonders Küche und Bad sind sehr ansprechend.Auch der Balkon(Blick aufs Meer) und die Terasse laden zum Faulenzen und Geniesen ein.Kleiner Nachteil ist doch die Entfernung zu Meer.Doch für uns kein Problem, da wir eh mit unseren Hund mit dem Auto zum Baden nach Algajola fahren mussten.Die beauftragte Hausverwaltung ist sehr freundlich und hat uns alles erklärt.Die Kaution musste ich nach der 4 Wochenfrist nochmals per Mail einfordern.Wir würden aber jederzeit wiederkommen. Location très agréable, ou on se sent comme chez soi; tout y est prévue pour notre confort. Location entre mer et montagnes, avec une terrasse ouverte vers la mer à perte de vue. Gite décorée avec très bon goût, très bien équipée. Point des départs vers Pigna, San Antonino, Corbara et son couvent. Chaleureux accueil pour nous et notre petit chien! Merci Daniela pour votre charmante appréciation. Nous espérons vous recevoir à nouveau à Santa reparata. Avec sa vue splendide sur le petit port de l'Ile Rousse, l'appartement du "Figuier" possède tout le nécessaire pour offrir aux occupants un bon séjour. Non loin de toutes les commodités, le petit village propose de petits commerces de proximité et des artisans fort sympathiques. En résumé, une adresse à conserver pour rayonner sur toute la Balagne. Jolie petite maison de village! .Only 5 minutes drive separates you from the sea and walks abound from the house. La location va du samedi au samedi mais, selon disponibilités, vous pouvez arriver avec notre accord un autre jour de la semaine.. Le ménage peut être réservé pour 70 € en plus du prix de la location La location des draps est de 12 € par lit, dans ce cas les lits sont faits à l'arrivée. Vous pouvez aussi réserver les serviettes de toilette pour 5 € le jeu. Les chiens sont acceptés avec un supplément de 40 € la semaine.